Motherhood Moment: Book Nook: Where's the Party? Book Nook: Where's the Party? 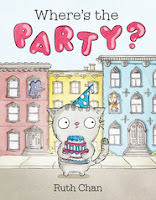 I had a chance recently to review Ruth Chan's debut picture book, Where's the Party? It's the first book in a new series, Georgie and Friends, starring Georgie, a very well-meaning cat and his wacky friends and neighbors. I enjoyed the book. The animal characters are cute, with big, expressive eyes. In the book, the poor cat wants to have a party, with a very simple list (make list, get cake, invite friends)....but all of his friends can't come. However, there's a very heartwarming ending. This book also had a lot to notice, making it fun to read over and over for young kids. For example, I didn't notice what was happening to the cake throughout the book until I got to the end, and then I had to go back and take a second look at all the illustrations to realize what I'd missed! It's a fun book for kids with a simple sense of humor and a satisfying happy ending.